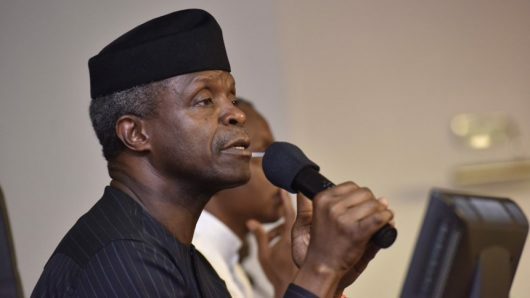 A group representing retired and active footballers yesterday in Abuja urged the Acting President, Yemi Osinbajo, to order an immediate withdrawal of security men from the Nigeria Football Federation (NFF) Secretariat. The group was led by Harrison Jalla, President of the National Association of Nigerian Footballers (NANF), as well as Victor Baribote, a former Second Vice-President of NFF. It argued that the presence of men of the Department of State Security (DSS) at the Glass House at Wuse Zone 7 in Abuja was inimical to football development. During a peaceful protest at the NFF Secretariat, just before the gates leading to the Glass House, the group described the development as a violation of the rule of law. The protesters carride placards with inscriptions such as “Nigeria is a creation of law, DSS should obey the laws of the land’’ and “FG, sack DSS Director of Operations’’. Other placards bore inscriptions such as “Osinbajo, direct DSS to follow rule of law, our laws are being disobeyed’’ and “Tell DSS to obey rule of law’’. Addressing sports journalists thereafter, Jalla noted that the continued presence of DSS in the NFF Secretariat was an affront on the Nigeria Constitution. Jalla restated the call for ther withdrawal of DSS personnel, saying it was time to uphold the tenets of the country’s law, and warning that failure to do so could lead to “anarchy’’. “There will be anarchy if by tomorrow (Thursday) they (DSS personnel) don’t leave here,’’ he said. The former player of the defunct Bendel United Football Club of Benin also said Tuesday’s warning by world football governing body FIFA on the NFF leadership crisis was insulting. “Nigeria is a sovereign nation, and it deserves a lot of respect. So, FIFA should be mindful of whatever directive it is giving,’’ he said. Also speaking to journalists, Baribote said he was at a loss as to why a creation of the Nigerian law like the DSS could be instrumental to the violation of law. Baribote said that the DSS which was not above the law was duty bound to comply with a court order. “It is shameful that a creation of law like the DSS is violating the law. It is supposed to comply with the order of the Supreme Court which is the highest court in Nigeria,” he said. Baribote also averred that FIFA has no right to step into the NFF leadership crisis, saying it was a matter to be resolved among football stakeholders in the country. The DSS had occupied the Glass House since July 23 when it chased out the Chris Giwa-led faction of the NFF. The security outfit had said it was acting on a presidential directive. The Giwa-led executive committee had on July 2 taken over the Glass House, saying it was in compliance with a court order.